hanagurizuka 鼻輪塚 / 鼻ぐり塚 "nose-ring mound"
Farmers send the nose rings of their cows, which come in all sorts of material, from plastic to metal. This temple is close to Kibitsu Shrine in Okayama prefecture. There is now also a statue of a large pig and the memorial service covers all kinds of livestock, bred for human consumption. Memorial services with fire rituals (goma) are held every month on the third saturday, but the mid-spring and autumn ceremonies are the most popular, because they can be combined with cherry-blossom viewing or red maple leaves. 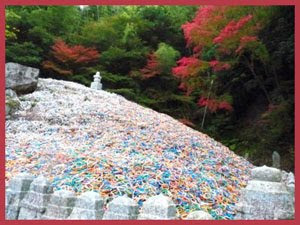 "hanagurizuka" is decorated with more than 6.8 million nose rings of cows. "the animal spends all its life for the people; it not only works in the fields but, after death, its flesh is then eaten and its skin is used for leather." 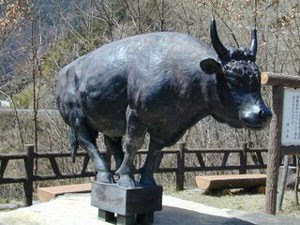 Since the early Showa period (1926-1989), the nose rings of cows have been put on the burial mound and twice a year—once in spring, and again in autumn—special ceremonies known as Chikukonsai are held to mourn the spirit of this beast.